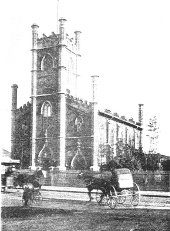 “In Toronto’s Church of England history, St. James Cathedral and Trinity Church as indissolubly united because they are the two oldest parishes in the city -- Trinity building however, is the older, as the cathedral has been destroyed by fire twice. The Gooderham family had a history of important service not only in church work, but in the defense of our country. When Canadians began getting ideas about independence and self sufficiency back in 1860 and threw out the Imperial troops, they suddenly found themselves with no troops of their own to take over. Consequently what was then the 10th Toronto Regiment of Volunteers became the Royal Grenadiers through the active work of several Gooderhams who continued to hold key military posts in our nation's earliest army organizations. Thus it is not surprising that a church like Little Trinity should have developed in its adherents a great, patriotic pride along with their religious spirit, and that they should make a tremendous contribution in World War I, and another important contribution in World War II. In World War I, no fewer than 481 young men from the one church enlisted, and 62 of them never returned...Today there are six memorial tablets on the walls of the church, two in memory of former rectors. The other four are in memory of William Gooderham, his wife Harriet Gooderham, James G. Worts and his wife, Sarah."